It�s a game to test if the student really learned about school subjects. Find the numbers from 11 to 20. 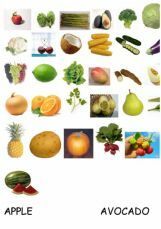 Students can have fun matching these fruits and vegetables or even going to the board and translating the words to their own native language, without looking at the pictures, of course!!!! The exercise helps assess learners� use of vocabulary items related to life events.It also evaluates the way learners structure some sentences about this topic. It is a subject verb agreement exercise. For third person singular, you need to use has instead of have. A cloze activity and a listening. Can be used either for revision or as an introduction into the topic History of the English Language. Dear Friends; You can find Present Continuous and Present Simple. General vocabulary review and Why..?Pressent Cont. 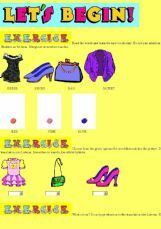 Matching exercise.